As mentioned last month, John caught a little mouse in the sink by putting a glass over him. Later we released him outside. When you can actually catch a mouse with a glass, that is probably a sign that you are over-run with them. At the following house meeting we decided to get some live traps. I was down at the Green Living Show a couple of weeks later and Green Leaf pest control was there selling the Ketch-All trap for $20. We gave it a shot, and its a magnet for mice! Caught 8 altogether over a period of about three days with no bait. I thought it was some new technology, but I googled it, and the trap has been around since 1924. What makes it so effective is that it takes advantage of a mouse’s natural curiosity to explore. The trap has a tunnel through it. 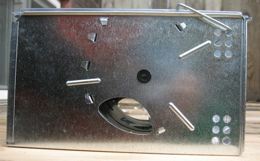 When a mouse enters, a spring-loaded baffle side swipes them into a spacious side chamber. Then we release them outside. I found a good spot by some railway tracks. As more mice get caught and released, they leave behind their scent inviting more mice to explore (or perhaps they are looking for their friends). It is suggested that you place the trap against the wall. The trap’s tunnel then seems like a shortcut to mice running along the wall. While no bait is necessary, I placed a piece of apple inside so that the mouse wouldn’t get too thirsty once caught. It was pretty obvious, though, when a mouse was inside as they chew on the metal, making a loud sound. I think we caught them all. The trap has been silent for over a week and there is no sign of mice. For more information, see Veg.ca’s excellent article called Dealing with mice and rats: A humane approach to pest control. The ultimate solution is to seal up all your cracks. Our kitchen is full of holes which will eventually be filled when we get to the pending renovation. Until then, we will have to rely on humane mouse trapping. Update: Since this post, two mice have been seriously injured in this trap and two others died. We contacted the manufacturer and this is a known problem with the Ketch-All trap. He recommended a more humane (and apparently equally effective) trap called the Pro-Ketch. Also, I was able to modify our trap and appear to have fixed the problems. Keep reading for more on this. Spring has sprung here in Toronto. Along with the first crocus flowers, there are tender edibles in the backyard and burdock and Jerusalem Artichokes to dig up. There are also more mice scurrying about our kitchen, and a few black ants. Horseradish sprouts are one of the first harvestable plants in the Spring. They are spicy but quite delicious especially in a sandwich or with corn chips. They don’t last long, in a few days they will be too spicy and tough to eat. But by then the stinging nettle will be ready. Stinging Nettle shoots. These are another early edible green. You have to cut them with scissors as the pricks will sting your skin, but once you boil the young leaves for a few minutes they go limp and are quite delicious in soup or by themselves. A friend of mine transplanted some for me several years ago. We keep them in a separate shady part of the garden as they grow like a weed and spread. In the backyard we also have burdock roots and Jerusalem Artichokes (kind of like a potato) to dig up, and there is always dandelion greens and roots. This year, once again, I forgot to trim the grape vines during the winter. Once Spring starts, any cuts will result in sap pouring out. A solution is to break several of the buds off with your thumb nail. Pruning a grape vine makes for larger grapes, and one advantage of pruning just the buds, is that you will end up with a thick network of grape vine branches that will help block raiding raccoons from reaching the finished grapes that hang down from the vines. 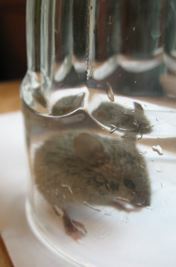 John caught this little mouse in the sink by putting a glass over him. Later we released him outside. We also trapped a little guy that had gotten himself locked in one of our cabinets. I also found one dead in the shower. I suspect that the neighbours maybe poisoning them. We share a party wall. Veg.ca has a good article called Dealing with mice and rats: A humane approach to pest control. Eating local organic in February! At the house we aim to eat a fair bit of local foods which isn’t always so easy in the winter. We shop at the nearby Dufferin Grove Farmers Market where the selection has whittled down to potatoes, beets, cabbage, onions, squash, leeks, turnips, shiitake mushrooms, celery root, carrots, apples, fresh baked bread from the brick ovens, and baby greens from a greenhouse. That last item turns out to be not necessarily the best choice for the environment. Greenhouses often require large amounts of energy for heating and lighting. See previous article. Many of these items were harvested a couple of months ago, but hearty roots, cabbage, squash and apples are technically still in season since they are easily stored. Does the food you eat involve burning dirty fuel? According to a UN study reported in the Guardian, climate change emissions from shipping amount to 1.12 billion tonnes of CO2 a year, or nearly 4.5% of all global emissions of the main greenhouse gas. This is almost three times higher than previously believed. Ships exploit a ready supply of the world’s cheapest, most polluting “bunker” fuel. Marine heavy fuel oil, which is burned by all large ships, is the residue of the world’s oil refineries. It is as thick as tar. Burning the stuff also releases alarming levels of cancer-causing air pollution (see pdf graphic). The industry has grown rapidly – to the point where it now carries more than 90% of the world’s trade by volume , and has tripled its tonnage carried since 1970. Cargoes also have to travel further due to a shift of production away from the US and Europe to China and south Asia. “Food imports from China have exploded over the past decade, rising nearly 300% to more than $705 million last year,” says a May article in the Toronto Star that cites Statistics Canada. China is now Canada’s fifth largest supplier of fresh fruits and vegetables. Another big category is fish and seafood. At the Toronto Food Terminal, Chinese peas sell for ten dollars a case. A vegetable wholesaler told the Star, “In Canada you couldn’t do it for that price if everybody worked for free!” There is the risk of Canadian farmers being priced out of existence. On a positive note, sea-freight emissions are much less than if you were to ship the same weight by airplane. The aviation industry is responsible for about 650 million tonnes of CO2 emissions a year. And due to their huge cargoes, ships are usually more efficient than trucks, and you don’t have to build highways. Importing New Zealand apples and other foods may result in less carbon emissions because the country receives plenty of sunshine and gets most of its power from dams. Greenhouse-grown roses in Holland require six times more energy than roses flown from North Africa to Europe. Because of methane emissions and feed crops, local meat has a much higher climate change footprint than imported vegetarian alternatives (more on this below). I buy imported avocados, limes, rice and lentils. But learning about the environmental costs of shipping reminds me to keep the focus on locally-grown and seasonal foods. Seasonal means eating stuff when it is in season (such as strawberries in June), or hearty foods such as roots, cabbage, squash and apples that have had their season extended by proper storing. Dry foods like grains, legumes, nuts and seeds are effectively always in season because they easily store for months and months. Preserving local food by freezing, drying or canning is another solution. A few weeks ago I wrote about how to give away stuff you don’t want anymore. The other side of that is finding free stuff. It can be fun and rewarding to go scavenging for treasure. You never know what you may come across. Currently, I stick to non-bagged residential “garbage.” Foraging for stuff behind stores, known as dumpster diving or skipping, is more involved. Below are some reasons, tips and suggestions, as well as photos of recent finds. find free stuff that you need. prevent useful things from being trucked to landfill or incinerators. find gifts for family, friends or strangers. give new life to an item that needs some simple fixing. rescue cans, bottles and papers that belong in recycling. Go around your immediate neighbourhood. Nearby finds are easier to carry back. Garbage day offers the best selection, and the last chance to save stuff from landfill. Look for houses that are throwing away a large amount of stuff – after a Spring cleaning or someone moving out. The first of a month is a good time to find stuff left behind by former tenants. Recently, Basil created this unique dish consisting of a layer of rice and lentils on top of a large Swedish cracker. It is topped with slightly burnt fried onions and nuts. Basil got distracted half way through cooking by seeing (and trying to catch with a bucket) a mouse, hence the burnt food. But it was very delicious anyway. We believe in being as humane as possible when dealing with our mouse residents. Veg.ca has a good article called Dealing with mice and rats: A humane approach to pest control. I will post more about mice later. I am always amazed at how easy it is to give away stuff in front of our house. Even things that I consider to be complete junk get snapped up, and I am no stranger to scavenging. Many of the items in our house were found in the trash. This is a great way to cut down on the “garbage” that gets sent to landfills or incinerators, while at the same time helping people in need. Meagan moved out this month and left behind an old bed (see photo above), wobbly shelf and a bunch of stuff that she intended to throw away. Joe claimed an old chair for his room, then helped me move the rest of the discarded furniture to the curb. The wobbly shelf made of white particle board was grabbed by the time we got back to the front door! I knew the old stained bed would be a harder “sell”. So I attached a note that read: “Good Bed. No bed bugs, no cats, non-smoking house.” The bed was gone after two days! I was amazed. All the smaller items have also been picked up. Only the old pillows remain. Arrange items as neatly and attractively as possible. Put items out well ahead of garbage day. Or if garbage day arrives, remove the items for give-away from the curb, then put them back after the garbage truck has passed. If a plug-in item such as a toaster, stereo or tool works, attach a note saying: “It works.” If it is broken, leave a note explaining this. Someone may know how to fix it or may want it for parts. When giving away old couches, bedding or carpets, leave a note explaining if the home was free from smoking, bed bugs, cockroaches, cats or dogs. Recently bed bugs have become a problem in Toronto. Some people are discarding infested items, but if the temperature outside is below freezing this will kill them. During warmer weather, if you see a nice item without a note, the only way to tell if it is safe would be to knock on the door of the house. If rain if forecast, cover items with plastic or move them to a sheltered place until the rain stops. If you have the time and energy, hold a garage sale first. If people have to pay something, they are more likely to value and make use of it. At the end of the day, leave the unsold stuff by the curb. Online, you can make use of Craigslist or FreeCycle to get rid of stuff. Work exchange at Lotus Feast – Why you’ll love it! What is a house fund?